“It’s great for voters to have choices. ... That's what Latino voters want," said NALEO's Arturo Vargas. Gil Cisneros is an education philanthropist who gave millions in lottery winnings to George Washington University to get more young Latinos in college and public service. Sam Jammal is a G.W. Law School graduate who worked for Latino civil rights, as a congressional staffer and in the Obama administration. They are two of the Latino newcomers contending in California's crowded 39th Congressional District primary on Tuesday. They also are part of a group of Hispanics who could tap into the demographic change that has occurred in pockets of California and help Democrats win congressional seats, though they face long odds to do so. California voters head to the polls to winnow the list of candidates in races for governor, Congress and down the ballot. Many absentee and mail-in ballots have already been submitted. Voters also go to the polls in primaries in a handful of other states, including in New Mexico, where Rep. Michelle Lujan Grisham, a Democrat who is chairwoman of the Congressional Hispanic Caucus, is seen as the front-runner for the Democratic nomination for governor. Cisneros and Jammal are in one of the most contentious congressional races in California and are two Latinos, among a handful statewide, with the strongest chances of helping flip a congressional seat held by Republicans. National attention has focused on the millions of dollars Cisneros and Andy Thorburn, who is not Latino, have spent on the race and on whether too many Democrats in the primary will turn the general election over to Republicans. But demographics have played a big part in making the longtime GOP seat open for the free-for-all primary. The 39th district, where the incumbent Republican, Rep. Ed Royce, is retiring, is majority minority, thanks to the growth in the Latino and Asian residents, who now make up half the district's population. Latinos are about a quarter of the district’s eligible voters and Asians about 15 percent. The state also has a number of independent voters who do not register with any party. But this is a conservative area where a good number of Latino voters have roots reaching back generations. Cisneros and Jammal are part of a surge of first-time Democratic candidates around the country, in what is largely seen as a backlash against Trump. They are hoping to finish in the top two, because all candidates in California run in a single primary, with the top two finishers moving on to the November election, regardless of party. But there are fears that with so many Democrats running the vote will split, opening the way for two Republicans to take both spots. Both candidates said they would have to appeal to all voters because of the crowded race and the lower turnout in a primary, but that Latino and Asian votes will be critical to flipping the seat should a Republican be one of the top finishers. Latinos were underperforming in mail-in voting, said Paul Mitchell, vice president of California-based Political Data Inc., which tracks the vote. Twenty-two percent of ballots were mailed to Latino voters statewide, but only 13 percent were returned, Mitchell said. In the 39th Congressional District, of 44,510 ballots mailed to Latino voters, 5,759, also about 13 percent, were returned. 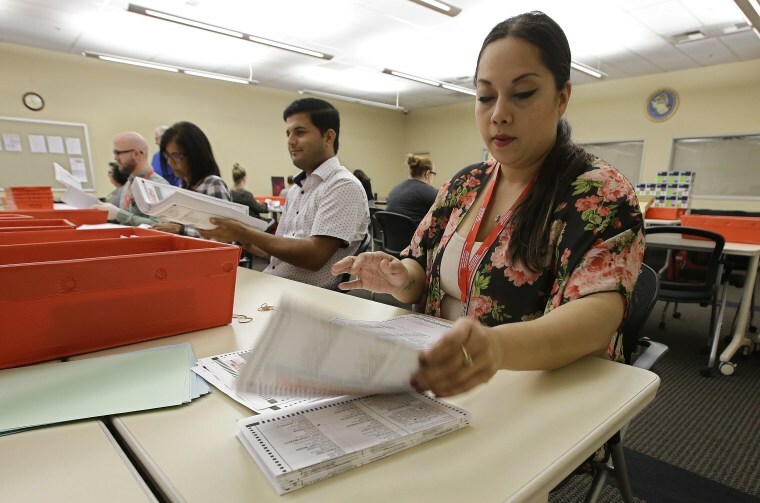 Some 57 percent of the Latinos who returned ballots in the district are registered Democrats, according to Political Data Inc.
“A lot is probably due to the fact that Latinos are younger, and young voters have really been tanking,” Mitchell said. While only 11 percent of Latinos 18-34 returned mail-in ballots, 43 percent of Latinos 65 and older returned them. Latinos, however, tend to vote on Election Day, so the numbers are not a projection of final outcome or performance. Hispanics are starting to dominate the Democratic Party in California, so it’s becoming more common to see Latinos compete against one another in campaigns, said Arturo Vargas, executive director of the National Association of Latino Elected and Appointed Officials. But with California’s "jungle" primary, pitting candidates of all primaries against one another, “if you have low Latino turnout, it may not be enough to get Latinos in the top two slots.” Vargas said. Democrats have been working in the district for 18 months, investing in field organizers and helping get out the vote, as well as supporting some campaigns with media ads. The Democratic Congressional Campaign Committee (DCCC) targeted 10 Republican districts of 14 the GOP holds in the state, according to the committee. — Former Los Angeles Mayor Antonio Villaraigosa is considered to be in a battle for the No. 2 spot in the race to replace term-limited Gov. Jerry Brown. Lt. Gov. Gavin Newsom is believed to be the front-runner and polls show John Cox in strong contention for second. Villaraigosa needs a strong Latino turnout to stay competitive. He’d be California’s first Latino governor in modern-day history if he won in November. — Democrat Mike Levin, whose mother is of Mexican descent, and Republican Rocky Chavez are in the race for the 49th Congressional District seat held by Republican Rep. Darrell Issa. The race has been tight with Levin showing a chance to finish second. — Beekeeper and businessman Michael Eggman and former Riverbank Mayor Virginia Madueño are vying to take on Republican Rep. Jeff Denham in California’s 10th Congressional District. Both are considered potential contenders for one of the top two spots. — Amar Campa-Najjar, a former Obama administration staffer, is running in District 50 to take on incumbent Republican Rep. Duncan Hunter. Campa-Najjar, of Mexican and Palestinian descent, has done well in polling.